Looking back to years ago, there are none of today's advance toy. So kids especially girls those days use their own creativity to come up things they can play with. One of it is paper doll. For instance a dress up doll which you can change her cloth to any style you like. 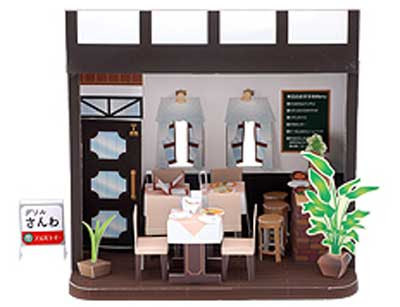 So today, I'll share with you a site that provide free template not to make a paper doll character but a doll house that you can use to play with your paper doll. It's a 3d house paper model, interior design for some parts of the house such as bed room and kitchen. And there type of building like restaurant as you see below, bar and more. Shin chan cubeecraft paper toy by PaperCraft Art Creative. For Crayon shin chan fans, they surely remembered September 2009 as a tragic month, the lost of a popular mangaka due to an accident. 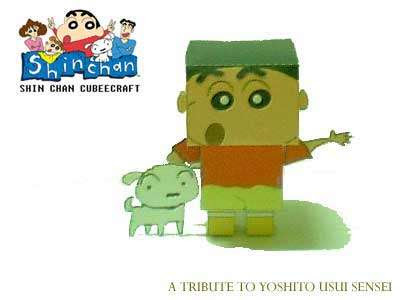 So as a tribute, I have prepared a cubeecraft of its main character, Shinosuke Nohara or more well known as Shin Chan, a naughty and mischievous kid. There is also shiro, his lovely dog. Talking about cubeecraft, there is popular website www.cubeecraft.com which I used as model to design this shin chan. 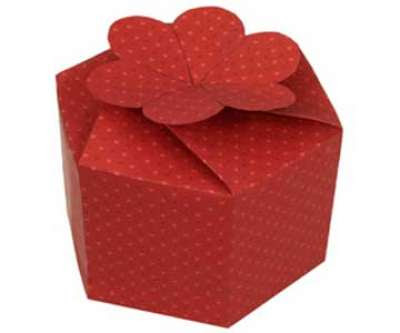 You may find many popular characters that were turned into a cube shape paper model there. Here is another pop up card that I want to share. It's suitable for valentine because of it's heart shape and nice look. It is not from Canon Creative Park but rather from another one of my favorite site for free pop up cards. Guess if you love making cards you may already know Robert Sabuda. He's a famous crafter and he owns a website named after himself www.RobertSabuda.com. He gathers and presents some of his art works at the site. The most interesting part is, he has prepared one section where you can download free templates of his chosen crafts. He also shows us step by step how to make them with nice pictorial instructions. Still on animal papercraft. 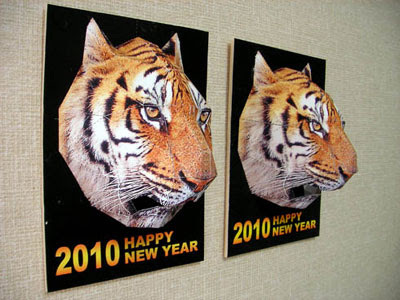 Since this year is year of tiger and later is Chinese New Year, enjoy this tiger paper model by Konika Minolta. The site is in japanese actually but you won't miss the template since it comes with pictures. Just look for any link pointing to 'sumatrae01.pdf' below the tiger picture. Yes, it is modeled after Sumatran tiger which is nearly instinct, only 400-500 of them left in the wild. It can be found naturally in Sumatra, a large island in western Indonesia. Beside this, there are also other animals such as chipmunk, rhino etc. I will feature them in my future post. Time for Valentine's day celebration. Beside gift, one popular thing preferred by couples is card. Though it's just a small thing and cheap, it hold so much meaning especially if accompanied by sweet romantic words written on it. Don't you think so? So lets upgrade your card for this year into another level. 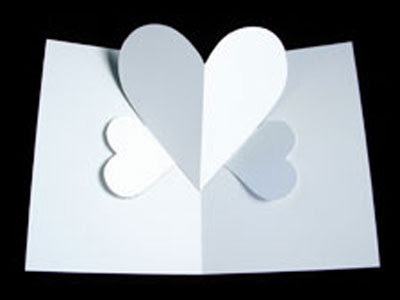 It's a valentine pop up card which you can make your self to show your love to your dearest one. This piece of art is prepared by Canon Creative Park. It's actually for last year's valentine but of course it's applicable for any time or occassion. 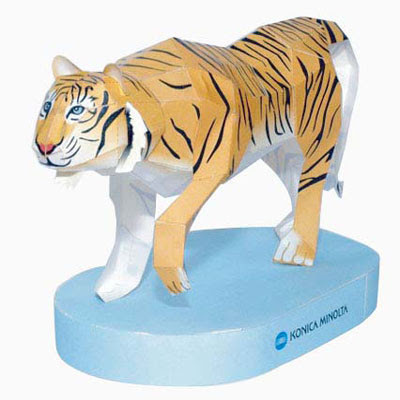 RAWRR.. you will get stunned by this cool tiger head paper model. Specially made for Chinese New Year 2010. It look real but of course with no fluffy fur. Hehe.. You can hang it on your wall though. I'm sure you will find similar craft in the future, of course with different animal head. I'll look forward to it and i bet you will too. Hi guys. Valentine is around the corner. 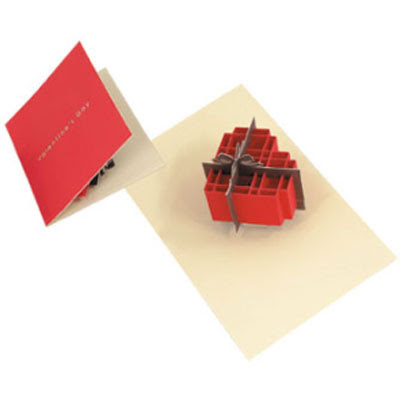 Upon looking for suitable papercraft for Valentine's day, I just stumble upon this cute gift box which you can make yourself with free template to print out. At Free PaperCraft Templates, we recognize that privacy of your personal information is important. Here is information on what types of personal information we receive and collect when you use and visit any page on free-papercraft-templates.blogspot.com/, and how we safeguard your information. We never sell your personal information to third parties. As with most other websites, we collect and use the data contained in log files. In this case, we use third party status counter such as sitemeter to track visitors behaviour and traffic data. The information in the log files include your IP (internet protocol) address, your ISP (internet service provider, such as AOL or Shaw Cable), the browser you used to visit our site (such as Internet Explorer or Firefox), the time you visited our site and which pages you visited throughout our site. When you subscribe to our feed via email, we stored your email address in feedburner which is managed by google. Here we guarantee that we won't sell your email and they are all save with us. All the incoming emails are autogenerated by feedburner to notify you the update of the post no more no less. This site contains links to other web sites. We are not responsible for the privacy practices or the content of any other website though we promise to try our best to bring only things that seem interesting to us and worth sharing, papercraft and art related. Hey guys. For any inquiry, please use the contact form below. Any comment or idea is very much appreciated. We also welcome any crafter who want to share their work here. Just leave me a message with link to the craft page and I will definitely contact you as soon as I can. Upon featuring your papercraft here, you can also get a quality link back to your site besides general visit from visitors who are interested in your work. I wish you a good time exploring the site. Happy crafting to all! Subsribe and get update via email daily!